I have never put as much effort into preparing for a 2-week holiday as I did for Cuba, and even then I couldn’t compete with my fresh-faced afro-latina aphrodites. An assault on the senses at every turn, dizzying heat and a host of essential places to go on borrowed time. Enjoy my mini guide to Havana’s essentials! Arroz y pollo y plantanos food stalls (rice, chicken and plantain) – cheap, cheerful and a good way to practise your Spanish. Note: tourist prices are different than the ones for local Cubans. This is displayed clearly. Café Taberna Bueno Vista Social Club – you can buy tickets (which include entry to the show and two mojitos) from a tour guide from Iberostar Parque Central hotel. Ours were pre-arranged with The Holiday Place. El Floridita Bar – it’s a hotspot for tourists, so the cocktails are a little pricey, but the fancy décor/ambience almost makes it worth the trip; it was also a favourite hangout for Ernest Hemmingway. Note: prepare for staring from tourists if you’re a group of beautiful, black/brown girls with confidence, cute outfits and winning smiles. The Upmann cigar factory tour (formely ‘Romeo y Julieta’) – the chance to see some of the world’s most premium cigars being rolled in front of you. Try and build a good rapport with the tour guide, as they may be able to get you good cigar deals! Note: You aren’t allowed to photograph or record the workers. A Café de la Musica – So this night was odd. We had planned to go to one of the popular ones [Café de la Musicas are live music venues/clubs] in central Havana, but the issue is none of the taxi drivers we approached seemed to know which one we were talking about. We were then taken through a labyrinth of alleys and residential areas, and at this point my mild concern swiftly changed to having my stilettos in hand (just in case). When we eventually arrived at this nondescript venue, tucked behind dim streetlights and a group of forlorn revellers, we were a little dazed and disorientated. In the end the night picked back up again: the Havana Club rum was dirt-cheap, a guy two rows ahead of us continuously dropped some serious shoulder shimmies and the live band performed with all the gusto as one presented before concert goers at Madison Square Garden – an impromptu adventure to mark our last night in Havana! Museo de la revolución – We were told if there was one museum we had to visit in Havana, this one was it. Housed in the former presidential palace of Cuban presidents of old, Museo de la revolución is a grandiose structure of opulence and decadence. After clearing security (we weren’t allowed to take bags inside) we started from the ground level and eventually made our way upstairs. This was naturally a celebration of the pro Cuba communist revolutionary era (and a few digs at western imperialism). 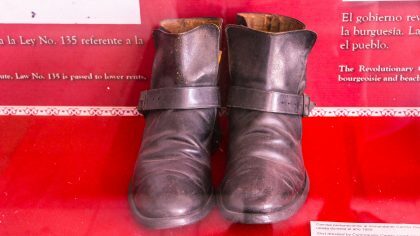 My highlight was seeing Che Guevara’s personal possessions/military uniform. We finished off our visit with some refreshing mojitos in the museum café – naturally. Cuban cocktails – Strong, flavourful and cheap. All of it. Everywhere we went. From daiquiris to Cuba Libres – you will never be able to enjoy imitations of the real thing ever again! Salsa dancing at Café Taberna as the Buena Vista social club churned out a succession of up-tempo Rhumba, Salsa and Cha-cha-cha rhythms. Just out here living life dancing in the middle of old Havana with musicians playing authentic Cuban music. Casual. Calm. No big deal. 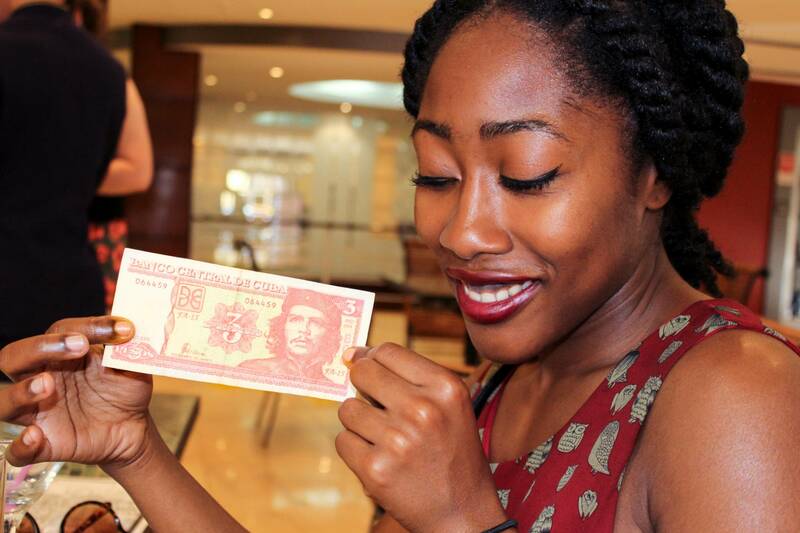 We could not buy Cuban money outside of Cuba and had to do so at José Martí airport. We also could only change our money back into Euros (€) or US dollars ($) on our return journey, as they had run out of Pound Sterling (£). There was no Wi-Fi anywhere we went. Do not drink any tap water (buy bottled water). Taking out adequate travel and medical insurance is compulsory before entering Cuba. Don’t rely on using a Visa or MasterCard. Many places are just now accepting them, and I hardly spotted any ATMs. The Holiday Place helped us book tours for the cigar factory and Café Tarberna. We had a local rep stationed at the Iberostar Parque Central hotel. The Holiday Place arranged an airport pick-up service when we landed. They also took care of our transport from Havana to Varadero, and from Varadero back to José Martí airport for our return to the UK. We opted to put down a deposit and then pay off the remaining balance in 3 instalments. When to go: Cuba is beautiful all year round, but if you want to avoid the possibility of constant rain I suggest avoiding the June – September rainy season. Getting there: Virgin Atlantic. Our holiday total was £1,500 (including return flights, airport transfers and accommodation). Medicine: Immodium, hand sanitiser, Piriteze, Mosquito spray (with deet). My Essentials: Lonely Planet Cuba guidebook with a map of Havana, camera/recording device, hand sanitiser and 3 outfits to break hearts and crush dreams. Next articlePeak District – drum and bass & pub hotels.